Wow. This week really knocked me out! I got hit HARD with a stomach bug that came on with one heck of a vengeance. It’s been a long time since I have been sick like that. I am typically the one that prides myself on how rare I get sick but I was waving my white flag in surrender to this one. Today is the first day I am starting to feel alive and I almost even have my appetite back–plain oatmeal, applesauce and toast have been about all that’s been on the menu around here. Pretty exciting, huh? The one thing I will swear by in times like these is ginger. Ginger is often used to fight nausea and it worked wonders for me over the past few days to settle my unruly stomach. Ginger tea, ginger ale, heck, straight up ginger can do the trick, just get some! I am such a baby when it comes to belly issues so I am so grateful to be back in action! And what better way to celebrate feeling healthy again than with a new overnight oats recipe! In the spirit of all things pumpkin, I decided to go with a pumpkin spiced version of my oats but with a tiny twist. 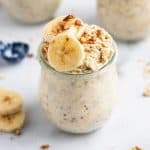 These Pumpkin Banana Overnight Oats are a combination of my personal favorite, my Banana Bread Overnight Oats and everyone’s fall favorite, pumpkin pie. 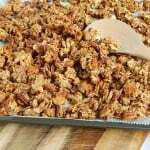 To be honest, I had been adding a little bit of pumpkin to my banana bread oats and really liked it. Then I decided to go with more of a pumpkin spice to really pull this one together. If you want the pumpkin but aren’t a fan of pumpkin spice then you really can just add some pumpkin to the Banana Bread Oats and still get a great pumpkin fix! I know you have heard this so many times from me, but overnight oats are really just the best breakfast. You can make them ahead and grab them out of the fridge in the morning. You can make them dairy free and gluten free. This recipe barely needs much maple or sweetener because the banana adds a natural sweetness to it. Make several of these at the beginning of the week and you are prepped for your early mornings all week long! Enjoy! In a mason jar or small jar that can be sealed, mash the 1/3 banana. Warm up in the morning or eat cold and on the go!